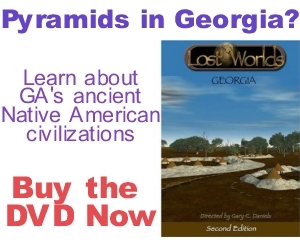 Above: Watch an excerpt from the Lost Worlds: Georgia DVD. 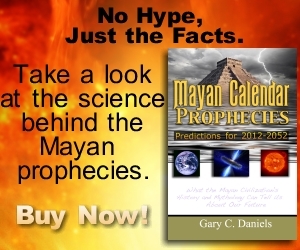 Buy today or make a donation and help support LostWorlds.org. 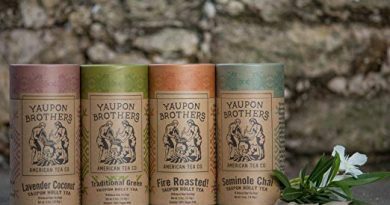 All sales help fund future videos and exhibits. 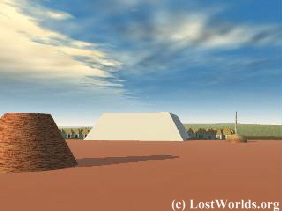 Watch more videos at LostWorldsTV. 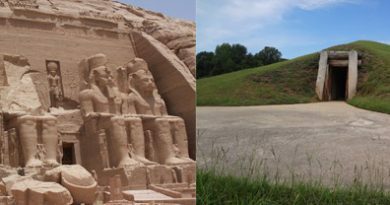 Kolomoki Mounds are the next great accomplishment of Georgia’s Native Americans. The Kolomoki Mounds site is believed to have been the most populous Native American community north of Mexico during its time period. The site consists of nine earthen mounds built between the years A.D. 350 and 750. 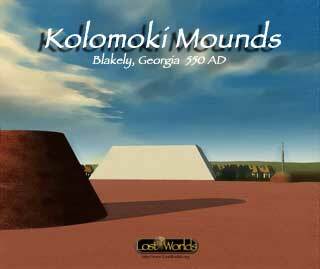 The largest of Kolomoki’s nine mounds is Mound A and it rises to a height of 57 feet. Its base is larger than a football field thus making it the Indian mound with the largest land base in the state of Georgia. The mound takes the form of a truncated or flat-topped pyramid. Although today the mound is covered with grass and a few trees, it originally would have been swept clear of any vegetation and covered with different colored clays. The final capping layer was made from red clay. Years before this red capping layer was added the mound had been completely covered with white clay. These clay capping layers are so thick and hard that early archaeologists joked it would take an earthquake and dynamite to ever break through them. View larger map Zoom in to see the actual Kolomoki Mounds site. Click on the individual markers to learn more about each feature. The southern half of the summit of Mound A is elevated three feet higher than the northern half. No evidence of structures has been found on the summit of the mound thus it may have served solely as a ceremonial platform or stage for public rituals. It also could have served as a platform for astronomical observations since pottery from this time period suggests such observations were being made and accurate calendars were being produced. It is also not certain how people reached the summit of the mound since no ramp led to the top. It is possible that steps were incorporated into the plaza-side of the mound’s steep face but this has not been investigated. This computer reconstruction shows how Mound D & Mound A might have appeared in 600 AD. This artwork is available on t-shirts, stickers, mugs, and other items in our LostWorlds Gift Store. 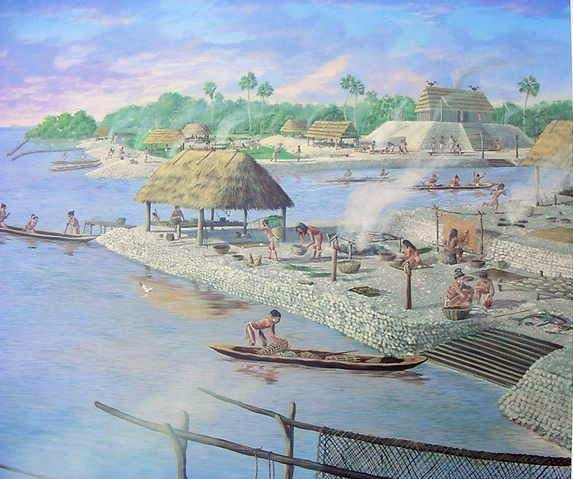 The burial mound itself was constructed over a long period of time and consists of several stages. 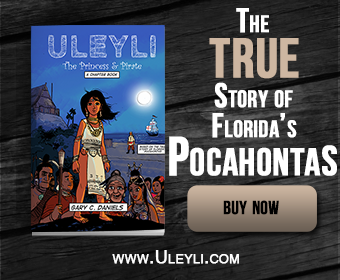 The first stage was a rectangular platform mound about six feet high created from yellow clay. A cache of 60 pottery vessels, including the aforementioned effigy pottery, was placed against the eastern side of this mound. Many burials later, the mound evolved into a circular platform mound about 10 feet high, still covered in yellow clay. After the final burial activity, the mound was completely covered with red clay and took its present form. These final burials were all placed in the east side of the mound with the skulls facing eastward. 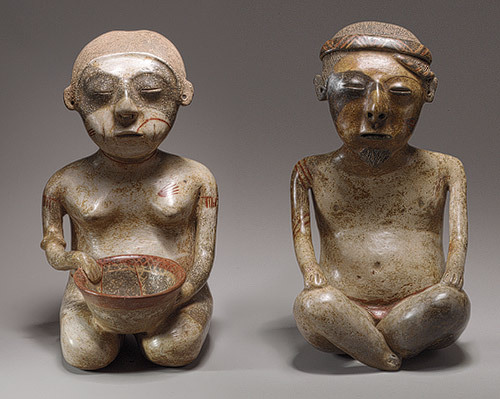 Burial objects made from copper and iron as well as pearl beads were included with these burials.